The internet, or at least the protocols behind it, are being extended into space. The man credited by many with having created the net, Vint Cerf, explains his vision of an interplanetary net. While I was a graduate student at UCLA I wound up working on a programme sponsored by something called the defence Advanced Research Projects Agency, otherwise known as Arpa. My job was to write software for the computers that we ultimately started putting on the Arpanet in late 1969. In the spring of 1973 one of my colleagues, Robert Kahn, described to me the different packet-switched networks that he was working on: the Arpanet that he and I both participated in, a mobile radio system, and a satellite-based data system. His problem was 'how do I get all three of these networks to inter-work with each other?'. We called that the "inter-net" problem because we were trying to get different "nets" to talk to each other. Within about six months of that meeting, we had come up with a basic design of what we now know today as the internet. We made a detailed description and by May 1974, almost exactly 30 years ago, we had published a paper that described how this could work and what the various pieces were. That thing we described 30 years ago is in large measure what you have today. We did not have all the applications written out but we had the underlying infrastructure for the communication. I then asked myself a question: What might we do to take advantage of what we have learned in building networks? The internet in particular, this global system - what might we do to take those lessons and apply them to the support of the exploration of the solar system? What you should appreciate is that whenever we launch a spacecraft it has on board a collection of instruments to sense various things. 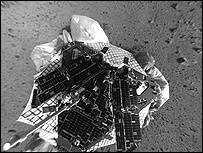 It could be high quality photography, or things to sense infrared, or types of minerals and things like that that are on the surface of the planet. We are trying to find out what is out there but in order to get that information back to Earth we have to communicate. What we are looking at now is the possibility of using the internet kinds of protocols to support the communications for spacecrafts that are moving around in the solar system. When you get it out in space everything is different. For one thing everything is a lot further apart. For example, Earth and Mars are 35 million miles apart from each other, when closest together in their respective orbits around the Sun. They are 235 million miles apart when farthest apart in their orbits. 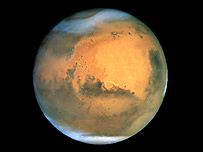 At the speed of light, 186,000 miles per second, it takes five minutes for the light signal or radio signal to go from Earth to Mars when they are closest together, and 20 minutes when they are farthest apart. The notion of trying to control a device remotely when it is very, very far away is an amusing image. You can imagine seeing an image which is 20 minutes old coming from Mars, so you are seeing where your rover was 20 minutes ago. If you want to move it somewhere, you move the joystick to say "go right' - but the rover will not hear that for another 20 minutes, so we have this 40 minutes' round-trip time. If you have steered it in some direction which is going to get it in trouble, like going over a cliff, by the time you find out 20 minutes later it is long gone. So there is no such notion as "now" in an environment where things are so far apart. We have made a considerable amount of progress in the last five years. The project started around the spring time of 1998 and here it is about six years later. We have gone through several iterations of the communication protocol design - the details of how you communicate in this strange environment. What we have managed to do is to get several layers of protocols specified. All of these kinds of network protocols come in like layers of a layer cake. We defined the lower two levels: they are already on board the two rovers, Spirit and Opportunity, that are on the surface of Mars today. The other layers of protocol that we are testing here on planet Earth, we hope to send to outer space in around 2009 with a specialised telecommunications orbiter. We are not too many years away from having a kind of two-planet internet in operation. 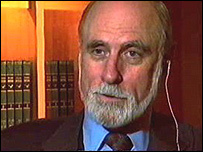 Vint Cerf was interviewed for the BBC's Click Online programme.